Many abstract games don’t seem to have a story. And while there may not be characters involved, there is still a story arch, a trip that the player goes through when playing. This story arch is filled with moments of tension, excitement, success, failure, meditation, etc. A game without an interesting trip lacks engagement. Stories have specific structures: beginning, middle and end. Movies are a prime example of this structure. At the beginning audiences are introduced to the world. Then, the main character sets a goal. From then on, the character goes through all sorts of obstacles and conflicts to achieve their goal. In the end, the character ends victorious or defeated. Either way, the character (as well as the audience) should have learned something. 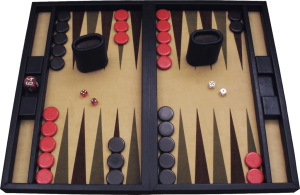 Let’s take Tetris or Backgammon as an example. Both games are abstract. However, when playing, it is the player who is the protagonist. Good games set the rules quickly and easily. In fact, that is why we have tutorials. Soon, the player should understand what the goal of the game is. Some games let you set you own goals. That is fine too. Whichever way, the player will confront dilemmas, skill tests and hard decisions in order to achieve said goal. At the end of the game the player will either fail or succeed. This sort of arch is very present, and it should set as a base for entertaining games. A game without a goal (or without the possibility to set your own goals) won’t do very well – at least not in the long run. Games that are not challenging also lack excitement. Make sure you keep this in mind when designing a game and don’t count on the story itself to tell it. Your mechanics have a lot to do with the trip your player will take.